The first electrical systems generated direct current by means of dynamos. It was soon realised that there were serious limits to the area and the number of customers that could be served, and alternating current took over – which as we all know can be transformed from one voltage to another with minimal loss. Very quickly, (in 1885) Italian Galileo Ferraris realised that two windings set at an angle to each other could produce a rotating magnetic field, something of great help when motion is required, and just two years later the 3-phase alternator appeared. Three phase power is is comprised of 3 related voltage sources supplying the same load. It is a significant improvement over single or two-phase power. The three voltage or current waves follow each other ⅓ cycle apart, and (ideally) if you sum the currents together at any instant, they balance perfectly. For a mechanical analogy, think of a wheel with three elastic bands fixed to the rim 120° apart, all tied together in the centre. The forces there are perfectly balanced, the knot stays at the centre of the wheel. The bands represent the voltages or currents, and it's easy to see that everything balances perfectly. More importantly, the power is continuous and constant, so three phase motors run more smoothly (we've all heard bottles rattling in the refrigerator, which is usually powered by a single phase motor that vibrates as a result of the power pulses at twice mains frequency). There are important advantages for the power companies. If all the currents balance exactly, they don't need a neutral conductor. Look at a high voltage overhead line and you'll see 6 bunches of main conductors and a thin single conductor at the top. The three bunches on one side are the three phases of one circuit, a second circuit is on the other side, and the single conductor is an earth which has probably an optical fibre core for signaling and communications. There is no neutral conductor. Likewise, there are also savings to be made on the amount of iron in transformers, because the magnetic fluxes balance where they meet. The main advantage comes with motors. The three phase currents set up a rotating magnetic field inside the motor and so the motor will start to rotate on its own. No special mechanism is required. e.g. A phase shift capacitor and extra winding usually used with a single-phase motor. Traditionally in the UK, the three phases were identified by the colours Red, Yellow (or White) and Blue; with Black for the neutral and Green for earth. Pan-European harmonisation in 2004 led to the standard becoming: Line 1 – Brown, Line 2 – Black, Line 3 – Grey, Neutral – Blue, Earth – Green/Yellow stripes. [A comprehensive table of the colours used in various countries can be found here: https://en.wikipedia.org/wiki/Three-phase_electric_power]. 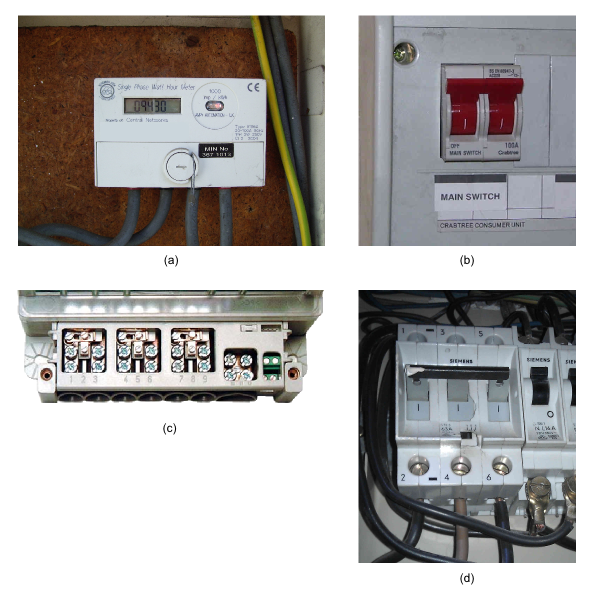 The obvious way to tell if you have a 3-phase supply is to locate your meter and distribution board / consumer unit. Not counting green or green/yellow earth cables, if you have four reasonably thick cables connecting to the meter, two of which go to your consumer unit or fuse-board, you don’t have a three- phase supply. If you have eight reasonably thick cables connecting to the meter, four of which go to your consumer unit or fuse-board, and your main circuit breaker has 3 or 4 sections with one operating lever working all three or four – known as a 3-pole or 4-pole linked MCB, then you have a three-phase supply.